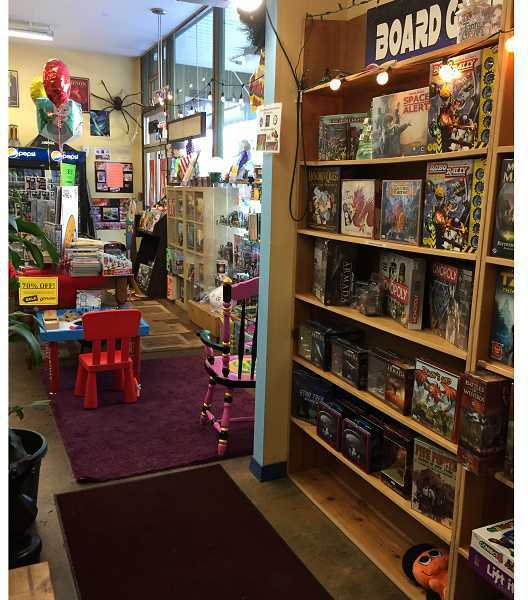 You don't need to be a nerd to fit in at this gaming and collectibles shop in Hillsdale. I don't consider myself a nerd for the most part, though I certainly can get nerdy about some things: grammar, Jane Austen and Shakespeare, to name a few. But nerds surround me in my family. My husband reads almost nothing but science fiction, my son is heavily into Star Trek reruns from every iteration of the series, my nephew plays Dungeons & Dragons, my niece is an illustrator who regularly attends Comic-Con (in costume) and my cousins, well, they're just really into math and computers. Nevertheless, in spite of all the nerds and/or geeks in my life, I didn't think I had much occasion to walk into a game and comic book store. But something about the look of Other Worlds Games in Hillsdale Center (6350 S.W. Capitol Highway) drew me in. Maybe it was the inflatable dragon out front. I was curious, and ventured inside to investigate. What I discovered is that the store's selection of board games is enormous, and I can definitely get into a good board game every now and then. Turns out Other Worlds Games is for me after all! With action figures, T-shirts, posters, collectible cards and card games, sci-fi books, graphic novels, sci-fi/fantasy/adventure board games, standard board games, and, of course, comics, it also would be a great place to find a gift for some of those nerdy folks in my life. Upon checking out their website, two things stood out to me, First, the name of the store is spelled with an apostrophe online. "Other World's Games and Comics" implies the shop is the Other World to which the games and comics belong, which very much amused me. On the store awning, there is no apostrophe — meaning, I suppose, that other worlds can be discovered within the shop. Either way, it totally fits. I was also tickled by this statement on their 'About' page: "Every once in a while, a shuttle arrives from a nearby free-trader, starship or a distant star system. Most of the time they drop off their otherworldly goods at our reputable space dock for us to buy or trade, the usual routine. Sometimes, they bring uninvited 'guests' who partake in our many 'games of chance.' On occasion, these 'guests' have been known to take on passengers (some not so willing) back to their ship. "Regardless, we don't ask questions and they don't give us problems. They're mostly here for the games and the fizzy drinks. If you see one during your visit, pleeeze don't meddle in their affairs. (Twitch!) It upsets relations with the Galaxy Trade Federation. Just enjoy the merch and the view. Oh, and by the way, check your blasters at the door." I just love that. I may be an outsider to this world, but I can appreciate the sense of humor and play that owner — or "Director of Fun," as the website states — Ronald Connell brings to his business. I get the sense that working there must be a lot of fun, and the fun is extended to customers in different ways. For instance, Other Worlds hosts a Board Game Night on Thursdays from 6-9 p.m., when you can go and play a variety of board games with like-minded folks and even enjoy free pizza while it lasts! There's also a large area set up with tables for game playing any time. In general, the atmosphere of Other Worlds is chilled-out and friendly, and the employees are really helpful and nice. Even a non-nerd like me felt right at home. Stop in and see what fun might be in store there for you! Other Worlds Games is open Monday through Wednesday from noon-8 p.m., Thursday from noon-9 p.m., Friday from noon-11 p.m., Saturday from 11 a.m.-7 p.m. and Sunday from 11 a.m.-6 p.m.